Foster and adhere to the RESPECT for one another. Respect is not to be expected. Respect is to be given. Do not expect to earn the respect from the other person before you respect him/her. Simply give respect. It will come to you abundantly. 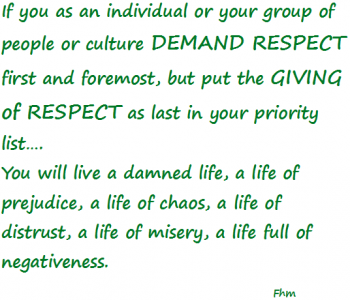 If you as an individual or your group of people or culture DEMAND RESPECT first and foremost, but put the GIVING of RESPECT as last in your priority list…. You will live a damned life, a life of prejudice, a life of chaos, a life of distrust, a life of misery, a life full of negativeness. Children may not know what the word respect means. But they know what it feels like to be respected or be disrespected. They may have not have heard the word yet or made any reference to that word in what they feel, but deep inside they already know what it feels like to be respected. It is instinctive to want to be respected. Children can feel when they are disrespected. They can feel when they are respected. Words, tone of voice, and actions are felt by children. These feelings are carried forward to adulthood. Bestow gentleness upon the child. Start with these words “be nice”. Even toddlers can learn to be nice. From there, parents or guardians must teach children what the word respect means. Teach them the greatest twin virtues of Respect and Kindness. They must teach that respect must first be given before it can be expected or demanded. Help a child grow with love, teach him/her discipline and build his/her character with respect and kindness, groom his/her personality with apology and forgiveness. Surely, prudence will guide his/her decisions later in life. Insult: “To speak to or treat with disrespect or scornful abuse”. Disrespect causes or prompts us (children and adults) to insult others. Disrespect gives an individual the feeling of superiority over others which can lead the individual to be a BULLY. What is a bully? It is OK to be a bully? Why do many people look up to bullies? Mostly, the only time that people disapprove the actions of a bully is when they become victims of the bully. Most will say that bullies represent the “bad” of society, yet these same people who say these things don’t do anything to take down or even reprimand the bully. Our modern society teaches children to “expect” respect. These same children who grow up to be adults mingle in society “expecting” respect. They do not respect others unless they are respected first. Now if you have these two individuals with the same attitude meet each other, what do you think will happen? If you are stopped by a police officer, will you obey the commands of the police officer? What if you think that you have not violated any law? Does the police officer have the right to stop and question you? Will you obey or talk back in a demanding way? Will you still show the police officer the respect as the officer of the law? The key word is “RESPECT”. The law enforcer has the obligation to stop the suspect. The suspect has the obligation to show respect and comply. In this situation when a suspect disobeys (action or words) or talks back disrespectfully, chances are an argument will ensue or even an arrest. When the suspect refuses to be arrested and fights back, what do you think will happen? Chances are the suspect will lose and if violence starts, chances are the suspect will be injured. Yet many political leaders and preachers teach to “EXPECT” respect! Riots and demonstrations are incited by these leaders. Why? Because they teach to expect respect and not to give respect first. How can a political leader get respect? Leaders who keep their promises, exercise integrity, increases the prosperity of their community or country and exercises prudence in dealing with others, will be respected. Political leaders who use money for leverage, do not require a whole lot of respect. They have their paid media followers, minions and propagandists to manipulate popularity charts. Most politicians follow the norm that politics is not about respect. Politics is about popularity and support. Hence, you can see political leaders who are disrespectful yet accepted by its country/community because of power and money. Anything done without respect is done either for the money, for a reward, as an obligation, out of pity, out of tolerance, out of curiosity, was told to, was forced to, was coerced to, for survival, or for vanity. Do your best to attach the ingredient of respect when you do anything. Respect makes a person care for another, it allows one to be open and be willing to have a good conversation, to allow the understanding of one another, which can ultimately lead to LOVE. Respect all the creations in this universe. We are its steward. Utilize all the material things around you but be sustainable, recycle or re-use and never abuse or waste. Always replenish. If you carry respect with you at all times, then that greatest advise, “to love one another” can be achieved. If everybody is expecting respect, how can there be respect for one another? On the other hand, if everybody gives respect, there will be no need to expect it. The only time that respect needs to be earned is when the respect that was kindly given was disrespectfully lost. The highest type of respect that anyone can bestow on anyone is to HONOR him/her. Honor is in fact earned. Respect leads to honor and love. Loving makes you share. Sharing love leads to peace, happiness and prosperity. There will always be the unintentional transgression, insult, trespassing, interruption or mistake that will upset, hurt or violate us. This is when we dig deep to find our patience, restraint, reason, and exercise prudence to avoid conflict. Never ever make the mistake of identifying tolerance for respect or kindness. Continued tolerance is cowardice. Do not allow those bullies to cheat, insult, and deprive. Tolerate if you must, until you are able to fight back. Fight, not because you hate or you are hated, fight because you are defending and protecting what and who you love and respect. NOTE: To those who think that they can love someone and not respect that person (e.g. I love my brother but I do not respect him. ), they have mistaken tolerance for love. Smile: A nod with a smile can mean the world to a child. It is a gesture of kindness and respect. Do the same for adults. Say thank you. Be grateful. Keep your promises: Respect yourself and others by keeping your word. Show up on time when you make an appointment. This shows that you respect the other person, by valuing his time. Exercise prudence. If someone made a simple mistake, try not to be critical immediately. Be willing to compromise. This shows that you respect the position of others. Do not interrupt. Let the other person finish his/her statement. Be polite and courteous. Move aside for others in traffic. Follow traffic rules. Obey the law. Do not cut in line. Wait your turn. Follow customs and traditions. Respect the culture of others. Do not talk too loud in a public “quiet place”.